Today we spent the day at the beach with some of the children from CIPI. It was a beautiful day filled with fun and laughter. The older children loved jumping backwards into the waves, while some of the younger children learned how to swim in the pool. It was a great way to build trust with these children. We saw their fear diminish as we held hands with them in the water and they relied solely on us. We felt very fortunate to give them what should be a normal day of fun for them. These children long to be loved. They are hungry for attention and affection. We hope that today showed them that they are special, valued, and important. We pray that the love that exuded from us will fill their hearts tonight as they lie down to sleep. We wish that we could save them all. That we could take them home and show them what it means to be cared for. However, we know that is not possible and that we cannot save them. What we can do is show them how much we love them and make sure they know that Christ loves them even more. Although we do not speak the same language, today solidified once again that joy, laughter, and love are universal. Tonight I was tasked with the task of all task, to write my installment of the infamous starfish blog. It is as follows. Today we spent the day with special needs kids and adults. It got me thinking about the term "special needs" which I've never really given much thought. Yes these kids have special needs, but they also have special gifts! They dance without inhibition and give the very best hugs and love and care for each other so deeply. 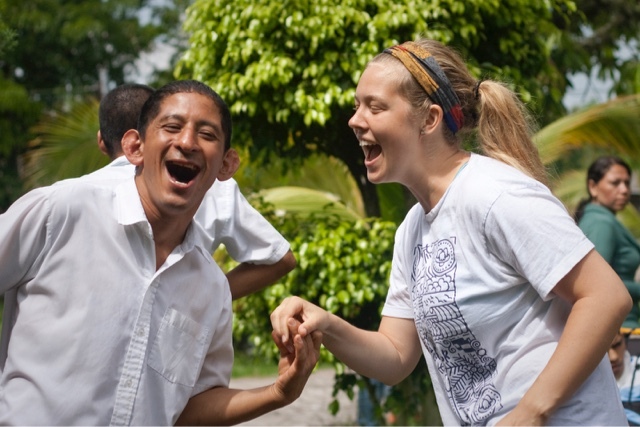 They are joyous and their smiles and laughter are contagious. And today, if not every day, their special gifts far out weighed their special needs. 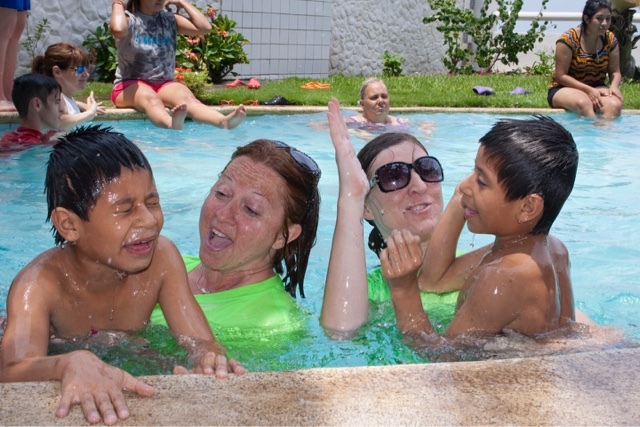 Our first stop of the day was San Martin, where the adult special needs kids live. We started by going into the houses of a few of the boys who were too sick or for some other reason unable to leave and join us for the upcoming dance party (a San Martin favorite). We found three men sharing a twin sized bed (yes, you read that right), all squished and contorted and snuggled up because it was the only bed in the room that wasn't broken. How humbling is that? We prayed and sang and sang and prayed and thanked God for their lives and begged and begged that he shower his love on them. And knowing my God, I can bet that he has and he will and will continue to for forever and ever. Next up = dance party! Oh how they love love love to dance. Screams and squeals of excitement were heard all around when we turned the music on. It did my heart so much good to see those happy singing faces! As I come back each year, they stay happy. Not once have we gone to San Martin and been met with anything less than a glimpse of the joy and love and complete and utter happiness that heaven holds! It was a morning filled with laughter and face painting and manicures (my girl Sandra did a pretty stellar job on mine if I do say so myself) and hugs and kisses and treat bags and all around goodness. And that, my friends, is San Martin: Happiest Place on Earth. In the afternoon we went to Tin Marín, the children's museum in San Salvador with the special needs kids from Guirolla. These kids are just awesome. They are so sweet and well behaved and were so so excited for the museum. We broke into small groups, a few Americans with a translator and 4-5 kids and got going. First of all, this museum is amazing. You have a tour guide of sorts that takes you around to all the attractions and does a stellar job explaining things and interacting with the kids and they just ate it up. They loved answering all her questions and participating in all the hands on activities and you could just see their little brains soaking everything up. We walked through a volcano and painted a car and become television broadcasters and made bubbles the size of people and shopped at the grocery store and the market and went inside a real life airplane! All in an afternoon and they just loved it. And all the while the kids who could walk were pushing the ones in the wheelchairs and taking care of each other and honestly just being lovely. That's the only word I can think to use. My groups last stop was the planetarium and you lay on the carpet and look up at the stars and when they turned off the lights one of the girls snuggled up and laid right on top of me and we just hugged and looked at stars and life was good. God is good and oh how thankful I am that he gave me a day full of special needs and special gifts. I know I am a day late, but yesterday was a very exciting and interesting day. Yesterday morning our team ventured back out to the building site to paint and furnish the house we had built the day before. The mother and her children were there to greet us with smiling faces. She could not express how thankful she was for us building her this house because it was a key component in getting back her middle son from the foster care system. The son that is in foster care was able to come to the site yesterday and spend quality time with his mother and 2 brothers. To see the mother interact with all her children was most certainly a blessing from God. We got to dedicate the house and lay our hands on the family as well as pray for safety, health, and blessing upon them for years to come. After leaving the building site, we went down the road to feed the community. The night before, our team made bags that held rice, beans, flour, sugar, and a bible. While we went on this expedition we experienced a minor set back, or so we thought. In El Salvador, it is rainy season, which means that is rains almost every day for at least a short amount of time. Well, when rain hits dirt, it turns into mud. Our bus and mud didn't mix very well. We got stuck in the mud for about an hour. Within that hour so many different people from that community came to help push our bus out of the mud. These people didn't know us, they didn't have to do that, but they wanted to. I know our entire team felt the presence of God in that hour. God knew that he wanted us to reach certain people that day, and we may have had to get stuck in the mud to do it, but we are glad we did. Isn't it crazy how God guides our steps each and every day? He knows what we need, and he knows what to provide us with. We can plan and plan but ultimately God is in control. In Matthew 25, the Bible says, “Whatever you did for the least of these, you did for me.” This is my third trip with Starfish to El Salvador and after just two days I have already been on an emotional rollercoaster and felt the presence of God in so many places. As we fed the homeless, God spoke right into my heart and reminded me why I keep coming back. As we drove along the streets handing out food, I saw many of the same kids, living in the same spot, and sniffing the same glue to curve their appetite. It is heartbreaking to see. Some don’t look older than 13 or 14 years old and they are on the streets all alone. It sometimes seems so hopeless because we want to do more for them, but we are at least able to feed them and show them Christ’s love as we interact and provide a meal for them. Today was one of the most physical days of our trip; build day. 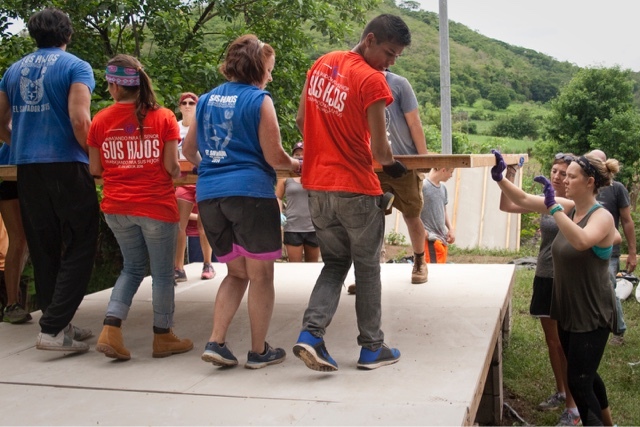 On this day, we build a house for a family in need. The family this time consists of a mother, father and three children. The initial work is physically draining and the team has to come together but since this is my third time here, I know the end result is so rewarding. Words can’t describe the feelings and emotions the families experience as the home is dedicated to them. I am very excited for tomorrow to dedicate the house to the family and experience them walking into their new home for the first time. We felt incredibly blessed this morning to worship with the people of Monte Calvario. We serve a God that does not know any language barriers. His presence and spirit could be felt as people from all different backgrounds came together to worship. After worship we were given an opportunity to minister to the children in the church. We shared the story of the Good Samaritan with them and tried to show them the importance of kindness and love. The children then participated in a craft activity. One little girl loved to pick the backs of the stickers off and place them on her visor. We watched her face and could feel her excitement without a word being spoken. Shortly after three team members performed a short skit using puppets. The story was about the love of Christ and the forgiveness He gives to His people. Before leaving we prayed over the children that God would continue to be the focus of their little lives as they continue to grow. 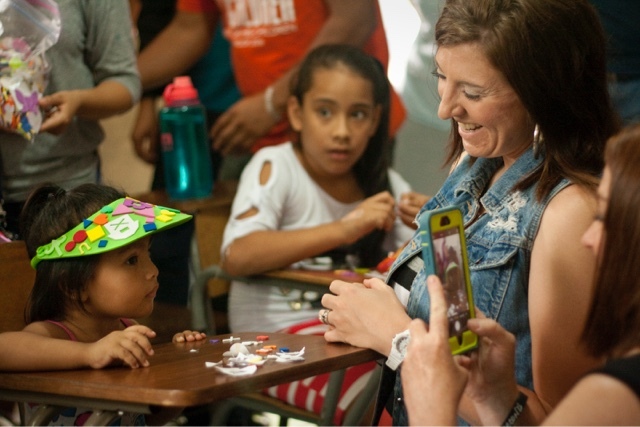 After leaving the church we had an opportunity to spend some time with the children at CIPI. Some of the children chose to participate in a game of kickball while others had their nails or faces painted. The children were full of energy and love. We had fun and could see that the children were thankful we were there. Finally, we made our way to the young moms staying at CIPI. We were able to watch their babies in order to give them some “me” time. We painted their nails and talked to them about their children and their futures. One girl in particular shared with us the goals she had for her future. She was also very honest with us about the fear and doubt she sometimes felt. We were able to speak with her and share the hope that lives inside of us. We encouraged her to work hard and pursue her dreams. To never give up. And most importantly to trust in the Lord. Before we left we prayed with her. We are praying and believing the promises of God’s word that He has a hope and a future for her and all of the young moms we encountered today. We are called to be the hands and feet of Jesus. As we reflect on today we feel so honored and privileged to be a small part of God’s plan for the people we encountered. We come here to pour out Christ’s love. To fill the people we meet with his love and hope. And at the end of the day, we are the ones that have greatly received. He is faithful and He is good!